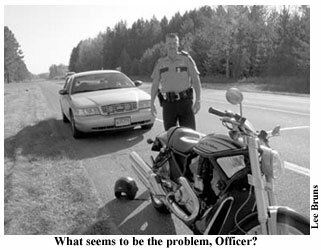 When I headed to Brainerd, for a rally, on my Moto Guzzi EV11, the idea was to enjoy the scenery and great roads around the Brainerd area. However, shortly after my arrival, the transmission on the Guzzi decided to jam in third gear. 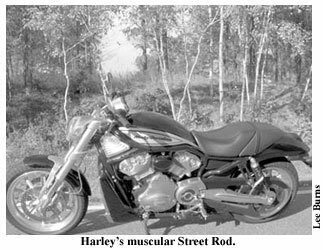 Paul Noskowiak, the manager of Brainerd Harley-Davidson, saved the day by tossing me the key to a 2006 Harley-Davidson VRSCR Street Rod. This really was full circle for me, as my first experience with the VR was from the stands at Brainerd International Raceway, rooting for underdogs like Pascal Picotte, Miguel Duhamel, Mike Smith and Chris Carr as they piloted the ill fated VR1000 race bikes. The muscular look of the Street Rod reflects the VR1000 race heritage much more than the V Rod ever did. The mid- mount pegs bolt on above the exhaust, giving the Street Rod ample cornering clearance. The narrow, low bars allow for a forward lean over the faux tank. The actual tank is under the hinged seat, behind the engine. This lowering of mass helps contribute to the bike’s impressive cornering manners. Other noteworthy features include self- canceling turn signals, locking side stand, fuel gauge, multi-function trip meter, and clean belt drive. The switch gear will be familiar to those who have ridden Harley-Davidsons, or older BMWs, but will take some getting used to for those riders familiar with Japanese or Italian brands. The inverted front-end and non-raked triple trees also help its back road handling ability. With 120 horsepower on tap and a five speed gearbox, the Street Rod will really haul the goods (so to speak). As long as those goods don’t need to be strapped to the bike anywhere, since the only place to hook a bungee is on the painted fender lip. Though the engine produces 120 hp at its peak, what makes this bike such a treat is all of this power is available under the peak. Just get the bike rolling, knock it in fourth gear, and roll on and off of the throttle as needed. The Street Rod produces such a broad application of power, that the shifting seems superfluous. Winding amongst the lakes and streams around Brainerd at a spirited pace (see picture below) delivered an admirable 43 miles per gallon on 90 octane fuel. The fuel tank holds four and a half gallons and if driven politely, should make an honest 180 miles between fillings. The seat was good for 150 miles at a time, so that worked out just fine for me. The long swing-arm and the twin-shock suspension out back handle road irregularities nicely. The ride quality is exceptional and mid-corner bumps never unsettled the chassis. As much as I enjoyed the bike though, there is one glaring fault. The gorgeous exhaust system hung on the right side of the bike forces the mid-mount pegs to be mounted far too high. The resulting seating position is more akin to that of a supersport than a GT. The full race tuck seems out of place on such a long wheelbase bike. If, however, you are tired of sameness of the GSX, FZR, CBR, or ZXR, maybe its time to take a long look at a VRSCR. The Motor Company has done an admirable job with the VR series of marketing towards a younger demographic. If I were in the market for a great daily rider that I could also use for bracket-racing at the local dragstrip, the Street Rod would be at the top of the list. The sun sets, and my time with the Street Rod ended all too soon. I returned to Brainerd H-D and fired up my Guzzi for a very long ride home, in only third gear. The old tech Guzzi has been a good bike for me. But with half the power of the VRSCR, and now only one fifth of the transmission gear options, this was not a fun ride home. Maybe it is time for me to look into one of those fancy high-tech brands . . .like Harley-Davidson.